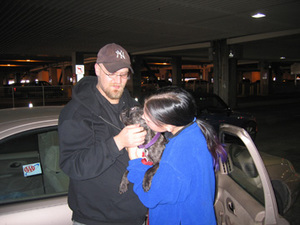 I am thrilled to report that last Thursday morning, I delivered one Mr. Phineas Frogg to his new mom in Denver. I could not have CREATED a better home for Finn. His new mom is a vet tech at a great specialist hospital in the Denver area, which means she gets amazing discounts on everything from boarding to surgeries to specialty food. With all of Finn's ear troubles, that's going to come in very handy. He has a new beagle-mix brother, Howdy, and they're already rough-and-tumbling around. He sleeps with his mom's roommate, whom I consider his "surrogate dad", and has his own couch, beds, toys... even a snazzy black and white jogging suit for those chilly Denver mornings. Finn is so beyond happy that it's made it easier to live with the palpable void he's left behind in the loft. And, of course, Stella & Bo are happy to have us all to themselves again. So this year, Christmas is in honor of Mr. Frogg, who lived with us for 5 1/2 months, filling our lives with sadness and anger (at the people who'd left him in such awful condition) but more importantly, joy and wonder (at his ability to forgive, love and be loved, without a moment's glance backwards).